Giving 'Long Shots' — Sanders and Others — A Fair Shot : NPR Public Editor Supporters of Sen. Bernie Sanders worry that the media is writing off their candidate too soon. At this early stage of the campaign, that's fair. But listeners have also written in, concerned about the overall tone of those stories, eight of which expressed skepticism about his chances, with five calling him a "long shot." NPR has also referred to him a "fringe candidate" and a "dark horse." New York Times columnist David Brooks, in the May 1 "Week in Politics" conversation, called him "unelectable." Many of those same stories have cast him as a foil for Hillary Clinton (who is far ahead in the polls), including an All Things Considered conversation with the online headline, "Why Hillary Clinton Is Just Fine With Bernie Sanders' Candidacy," and an April 29 blog post, "Vermont Sen. Bernie Sanders Jumps Into The Presidential Race," which quotes the Washington Post's political blogger Chris Cillizza, saying "Sanders isn't, really, concerned with winning;" he just wants to drag the Democrats to the left. NPR has also pinned Republican candidates Lindsey Graham, George Pataki, Marco Rubio, Ted Cruz, Rand Paul and Carly Fiorina with the "long shot" label, although not as frequently. My office hasn't received any complaints about those references, but Sanders supporters have made known their unhappiness. Lis Meade of Davenport, Iowa, wrote my office to complain that the articles that discuss his campaign in the context of Clinton's are "disrespectful." At this early stage of the race, every candidacy should be given equal footing and legitimacy and not marginalized by your pundits. Michael Green, of Las Vegas, Nev., was upset by the label "fringe candidate." In an email to NPR he wrote: "If a U.S. senator running for president against unlikely odds is a fringe candidate, then is that description being used for Rand Paul or Ted Cruz or Marco Rubio? I agree that Sanders seems to have no chance against the Clinton juggernaut, but the same was said of another U.S. senator who was by that definition a fringe candidate in 2008 — someone named Obama." And Joseph Goldman, of Port St. Lucie, Fla., wrote to my office: "At this early stage of the race, every candidacy should be given equal footing and legitimacy and not marginalized by your pundits." A recent Columbia Journalism Review article, "Bernie Sanders can't win: Why the press loves to hate underdogs," chronicled how "Sanders's entry into the race was greeted with story after story whose message — stated or understated, depending on the decorum of the messenger — was 'This crank can't win.' " NPR's coverage was not cited in the article. At this early point in the polls, Sanders is indeed running a distant second in a declared Democratic field of four. An average of recent polls shows him with a support level just under 12 percent among Democrats, just ahead Vice President Joe Biden (who has not declared that he will run). The most recent Quinnipiac University national poll, where Sanders made his strongest showing, put him at 15 percent. So at this point it is accurate to call him a "long-shot." But listener Green is also correct. As the Columbia Journalism Review article laid out in detail, candidates from Jimmy Carter to the current president have overcome "long-shot" status to win the White House. I asked NPR's Washington editor Beth Donovan to talk about the "long shot" label being applied to many candidates. She called it "neither unfair nor inaccurate." The stories, she wrote, "were largely about candidates entering the race for president, not the horse race itself. And in that context some reference to where a new candidate stands relative to others is appropriate at this point in the campaign." But she said she understands why some listeners might take issue. "One problem may be that the 'long shot' references often occurred in headlines and host introductions," she said, which could give a wrong impression about the story to follow. She added, "My sense is that the intent was to give context for what was ahead. That is to say, 'This is a candidate you may not have heard of or perhaps a candidate few think can win, but listen up. NPR feels he or she is important enough to be worth your time.' We do need to take greater care so that the introductory language engages listeners and reflects the stories that follow." Still, she said, "elections are contests," and NPR "won't ban phrases that assess the state of the race, even as we strive to minimize horse race coverage in favor of issues and ideas important to our audience." I also asked Donovan about how NPR uses polls to shape coverage. NPR, she said, "does consider polls to understand what issues voters care about. We also look at polls to get a sense of the shape of the electorate and which candidates appear to be connecting with voters. But we rely on reporting — and lots of field reporting — to guide our decision-making." Even mildly experienced political journalists and their editors understand that polls at this stage capture little more than name recognition. Michael Oreskes, NPR's editorial director and senior vice president for news, in a letter to the Columbia Journalism Review editors that he shared with me, wrote, "we do not use polling to allocate coverage," adding: "Even mildly experienced political journalists and their editors understand that polls at this stage capture little more than name recognition." The bigger challenge, he wrote, "is what I'd call the paradigm problem," that is, when "We get a certain paradigm in our heads. A conventional wisdom. Someone is a front runner, someone else a long shot. We develop this paradigm from a witches' brew of polling, money, instinct and the ineffable judgments of the chattering classes of political 'experts.' " The only antidote, he added, "is reporting." On that front, vis-à-vis Sanders, Donovan noted that NPR covered his announcement, his first big speech and his first trip to New Hampshire, which is "more coverage than many candidates get at this point in the election. 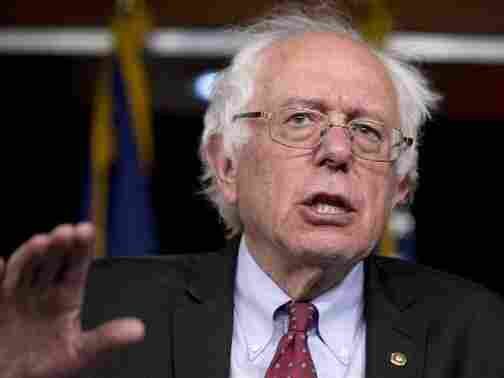 We chose to do so because Sanders speaks to an important, long standing share of the Democratic electorate and because Sanders is talking about issues of importance to all voters, whether they agree with his proposed solutions or not." A profile is in the works, as well. In my opinion, much of that reporting has been fair, starting with a Nov. 19, 2014 interview by Morning Edition co-host Steve Inskeep, which allowed Sanders to lay out his views clearly. And in the same April 30 All Things Considered conversation that Meade objected to, national political correspondent Mara Liasson said all of Clinton's challengers, including Sanders, "are serious, substantive candidates and Democratic activists all over the country have said they wanted a real debate, not a coronation, and it looks like that's what they're going to get." But going forward, as the campaign coverage gears up, I do hope that NPR will back off on what seems to me to be the overuse of dismissive terms, such as "long-shot," to describe Sanders, or any of the multitude of presidential candidates, whatever their party affiliation. As Oreskes wrote elsewhere in his letter: "Political journalists should not try to pick winners and losers. That's the job of voters. Predicting the outcome of elections isn't really very interesting and we aren't any good at it anyway."